now for sale at the market! 1. Heat oven to 425 degrees Spray a 17 X 11 roasting pan or shallow baking sheet with cooking spray. 2. Grate enough lemon peel to make 1 teaspoon. Squeeze lemon to make 1 Tblsp. juice. Set peel and juice aside. 3. Stir asparagus and oil in prepared pan. Season with black pepper and add broth. 4. Bake 20 minutes or until asparagus is fork tender -- stirring once. Top with cheese, lemon peel and juice. Preheat oven to 350 degrees. Bring a large pot of salted water to a boil over high heat. Prepare asparagus by holding bottom half of each spear and gently bending it until it snaps where it naturally breaks. Discard ends or save for vegetable stock. Cut asparagus into pieces, add to pot and cook until crisp-tender, 4-6 minutes. Reserve one cup of the cooking water, then drain asparagus. Melt 4 T. of the butter in a saucepan over medium low-heat. Add flour and cook, stirring for two minutes. Whisk in reserved cooking water, then the cream, stirring until smooth and thick, 8-10 minutes. Add paprika, then season to taste with salt. Layer asparagus, egg and sauce alternately in a medium baking dish sprayed with cooking spray, ending with sauce. Sprinkle with bread cubes, cracker crumbs and grated parmesan. Dot with remaining 2 T. butter. Bake until bubbling and golden, 25-30 minutes. Combine asparagus and water in a 2 qt. saucepan. Bring to boil and simmer 8-10 minutes, or until asparagus is tender. Rinse with cold water and drain. Blot with paper towels to remove excess moisture. Combine asparagus, yogurt and lemon in a food processor or blender. Process until smooth. In a medium bowl, combine asparagus mixture and remaining ingredients. Chill. Serve with raw vegys or tortilla chips. Mix together mayonnaise and sour cream. Pour over salad and toss. Chill several hours before serving. side until charred, then turn and continue cooking until tender, approx. Start with one slice of toast; add: a slice of good, tasty breakfast ham, lightly browned in a skillet. 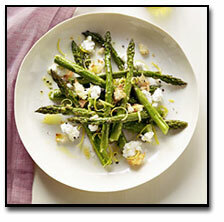 Steam: 6-10 stalks of asparagus until crisp tender. Place this on top of the ham; top with 2 soft poached eggs. I just add a little salt and pepper to taste-some like a little cheese sauce or Hollandaise. Try this for a quick one dish meal, its always been my family's favorite spring meal...I know I fix it at least 15-20 times during the usual 56 day asparagus season! Put cut rhubarb in medium sized mixing bowl. Combine flour and sugar and stir into rhubarb until well coated. Break eggs over mixture and stir until well blended and a heavy syrup is formed. Set aside while preparing crust. Roll out pastry dough to form a 9" pie shell. Put prepared rhubarb mixture into shell. Roll out remaining dough. Moisten edge of bottom crust. 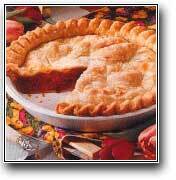 Place top crust on pie, seal and flute edges. Cut slits in top crust in several places. Reduce heat to 350 degrees and bake 30 minutes or until golden. Place rhubarb and strawberries in a lightly buttered baking dish. Mix together sugar , tapioca and orange peel and mix lightly. Pour water over. Let stand 15 minutes. 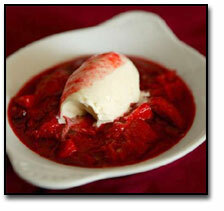 Cover and bake in a 375 degree oven for 30-40 minutes, or until rhubarb is just tender when pierced with a fork. Makes 4 to 6 servings. Delicious served over vanilla ice cream. To print a recipe please click on the "Printable Recipe" link following each recipe. A new window will pop up with a printable recipe card for that recipe. Make sure to close the banner at the top of the page if one should appear, click the print button and follow your computers print dialogue box to finish. If a printable recipe link doesn't appear on this page check our Recipe Archive page. Early American Indians dried asparagus for use later or to make medicine. Asparagus derived its name from the ancient Greek, who used the work to refer to all tender shoots picked and savored while very young. As early as 200 B.C. the Romans had how-to-grow directions for asparagus. During the asparagus season every eatery in Germany, from the tiniest brauhaus to the most elegant weinrestaurant offers their regular menu and a spargelkarte, a special asparagus menu, that may list as many as 45 variations of this first spring vegetable. A wholesome vegetable drink can be made from the cooled cooking water of asparagus as long as it is not salted too heavily. It is thought that asparagus stimulates immunity and also may help to lower cholesterol. It is a good source of folate and vitamin E.
Asparagus is also a natural diuretic. In China, asparagus spears are candied and served as special treats. Asparagus contains NO fat or cholesterol. Asparagus is a member of the Lily family. .
For women who are lactose intolerant, asparagus (and other calcium-rich non-dairy foods) can help with PMS symptoms. Purple asparagus is a variety (or more accurately a number of varieties) of asparagus. It tends to be sweeter than the green spears due to a slightly higher sugar content. As a result it is often good eaten raw in salads etc. Asparagus is the leading supplier among vegetables of folic acid. Asparagus is low in calories, only 20 per 5.3 oz. serving, less than 4 calories per spear. Asparagus Storage Tip: When you get home from the market, trim off about an inch from the bottom, much like you would with a bouquet of flowers. Fill a wide mouth glass jar with 2 inches of cold water, and insert the trimmed asparagus, making sure the bottom of every stem is immersed in the water. Take a clean plastic bag and fit it over the asparagus and glass jar, pulling down so that it is at least a couple inches below the rim of the jar. Place the entire thing in the refrigerator. Stored like this, the asparagus should stay fresh and crisp for at least a week, sometimes longer. Swap out the water if you notice it start to get cloudy. It's always best to use the asparagus as soon as possible, but this is a great way to extend the freshness and keep it from wilting before you are able to use it. Another name for the Rhubarb Plant is "Pie Plant". The rhubarb plant belongs to a group of plants of the genus Rheum.These plants are herbaceous perennial plants which grow from thick, short rhizomes. Rhubarb also contains vitamin A, potassium, and calcium. One cup of cooked rhubarb contains as much calcium as a glass of milk! Red color stalks contain more vitamin A than in the green varieties. As in other greens like kale, spinach, etc., rhubarb stalks also provide good amounts of vitamin-K.Vitamin K has a potential role in bone health by promoting osteotrophic (bone formation and strengthening) activity. Adequate vitamin-K levels in the diet help limiting neuronal damage in the brain; thus, has established role in the treatment of Alzheimer's disease. Handling recommendations for fresh produce . . .
First, it should not be placed in your trunk, no matter how short your trip.﻿ It should not be left in vehicles for any length of time. Most produce should be refrigerated right away. Exceptions are tomatoes and peaches -- refrigeration will diminish the flavor. However, we advise that if you have peaches that are ripening too quickly before you can use them all, by all means, they can be put in the refrigerator to keep them longer. Please don't hesitate to ask us if you have any questions! Click here to view our "Recipe Archives". Because we change our Jefferies Recipe Page with the availability of our homegrown produce, we thought it might be nice to continue to have our previous recipes available for you to view.